A sign protesting against AGL’s gas-fired power station shown outside the Dalton hotel. Photo: John Thistleton. 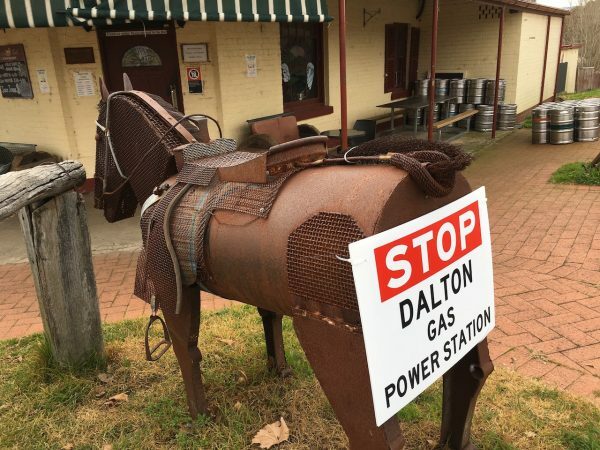 The 100 residents of the tiny village of Dalton have won out in a David and Goliath style battle against AGL, with the energy giant scrapping its current plans for a massive $1.5 billion gas-fired power station close to the rural village, 80 kilometres from Canberra. After an intense fight against the proposal, the residents are looking forward to getting on with their lives in their peaceful rural setting with AGL informing them that the current project application will be withdrawn and AGL “will take a step back and conduct a search for the most suitable site for this project”. While AGL has advised residents that the best site may still be at Dalton, they acknowledge that they would have to submit a completely new application and have it approved before the project could go ahead. According to the spokesperson for the Australians Against AGL Dalton Power Project, Alister Waine, this is unlikely to happen as AGL knows there is strong opposition to the project and would have to go through a huge amount of time and expense to address issues raised and do “everything again”. “I think they know that proposing to do anything here is not the path of least resistance,” Mr Waine told The RiotACT. Mr Waine said it feels almost surreal to know that the proposal the community has been fighting for so long is now off the table – at least in its current form. “It’s just this massive sense of relief. It’s just been hanging over our heads – our properties were worth nothing,” he said. The project to build the huge gas-fired peaking plant just three kilometres from Dalton was originally approved in 2012 but scrapped by AGL just months later. The original five-year project approval was set to lapse in July this year but AGL had applied to the NSW Department of Planning and Environment to have the approval extended by two years – sparking the recent battle with the surprised action group, who had believed the project to be dead. In a statement to the community late last week, AGL said that it had withdrawn its modification application for an extension of time in response to the community’s concerns. “The Dalton community has raised significant concerns about the Part 3A process which led to the approval of this project and the modification for an extension of time made in March 2017,” an AGL representative stated. “These concerns included environmental issues, visual impact, AGL’s lack of social license, integrity and approach with the community, as well as the financial losses caused to Dalton residents who invested in property assuming AGL had decided not to proceed with the project. AGL has told residents that they will now only be able to build a new peaking plant at Dalton if they lodge a completely new application under the provisions of the latest/current planning process and the new application is approved. Mr Waine said the battle against the power station had cost the community a lot in terms of “lost business income and sleepless nights”. “We just kept fighting and fighting and fighting and eventually we won,” he said. The massive power station was seen as a nightmare for villagers with up to six jet turbines and 45 metre-high exhaust stacks. Dalton resident Mike Stone told The RiotACT in June that there had been over $15 million worth of real estate investment in Dalton since AGL suspended the project in 2012. 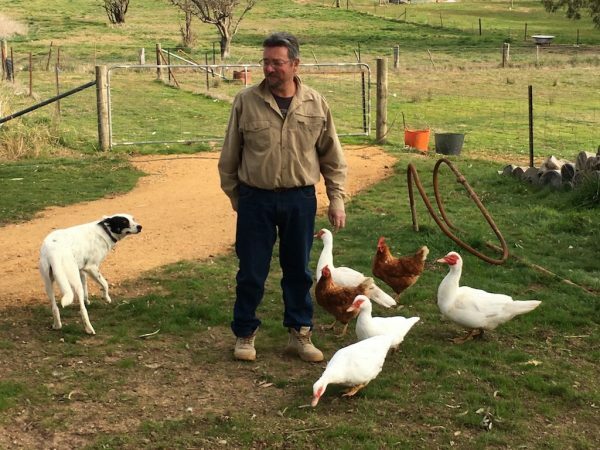 “These families bought land and built their homes with no knowledge of AGL’s plans. They may well have borrowed more than what their property will be worth if the project proceeds. Many planned developments have also been put on hold. Land sales have stopped,” Mr Stone told The RiotACT in June. With AGL backing down, Mike Stone can go back to enjoying his sustainable lifestyle at Dalton. Photo: John Thistleton. Mr Waine said that Dalton had been assisted in their fight against the power station by the residents of Gunning, who also faced significant detrimental effects, and also by Canberrans and others who didn’t believe the project had merit. With the battle over, at least for now, Mr Waine is looking forward to building the shed he’d put on hold and enjoying some peace and quiet. Are you surprised that 100 Dalton residents could secure such a win? What do you think about the on-again-off-again power station proposal? Let us know your thoughts by commenting below.